You’ve heard it before: Carnegie Mellon University’s Dietrich College of Humanities and Social Sciences is no ordinary liberal arts school. This spring, a new event will spotlight the diverse departments that make Dietrich College special. 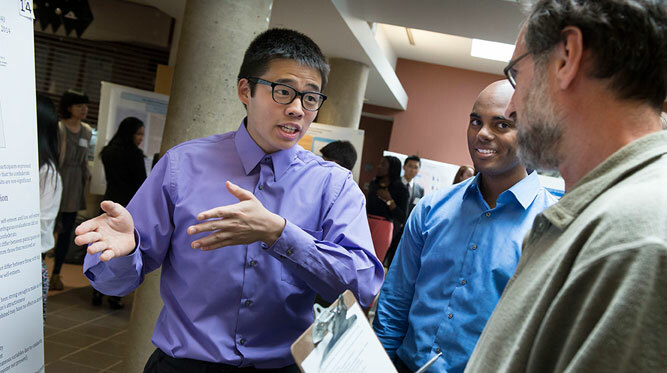 Discover Dietrich will give faculty, staff and students throughout Carnegie Mellon a chance to visit the departments within the college to learn about student research, faculty publications, internship opportunities and more. Ana Maria Ulloa, assistant dean and director of the Academic Advisory Center (AAC), hopes that Discover Dietrich will help foster relationships among students, faculty and staff. Running from March 28 through April 14, Discover Dietrich will feature showcases of student projects in the Information Systems Program and Philosophy Department, a Q&A with Modern Languages faculty, a talk about the psychological effects of alcohol use among adolescents and a panel discussion about storytelling with English Department faculty and local experts. “The college’s departments are hosting these events to get students excited about the research and projects students and faculty are working on in the various disciplines,” said Ulloa. Though the events are open to the entire CMU community, Discover Dietrich is primarily a vehicle to highlight interdisciplinary programs to current students within the college. Freshmen are encouraged to attend to learn about majors and course offerings. “There is always something new to learn about a department that could spark an interest. Students may find a new primary or additional major or even a minor,” said Academic Advisor Gina Mattucci, a Dietrich Day organizer. Considering how many (more than 30) majors are in the Dietrich College and how different they are (from Chinese Studies and linguistics to decision science and statistics), it is not surprising that there is always another aspect of the college to discover. The two-week showcase kicks off just in time for Dietrich Day, the annual celebration of all things Dietrich College that will be held on Wednesday, March 30. Among other Dietrich Day activities, college faculty, staff and undergraduate students will compete in a wiffle ball game at 2:00 p.m. on the CFA Lawn, with CMU President Subra Suresh throwing the first pitch. “By adding the Discover Dietrich component as part of our Dietrich Day celebration, we are highlighting the academic talent of our students and faculty while also creating spaces for intellectual engagement in fun and creative ways,” said Ulloa. Undergraduate students, faculty and staff can also show their college pride with a Dietrich Day T-shirt. The free shirts will be distributed near the main entrance of Baker Hall from 10:00 a.m. to 2:00 p.m. on Monday, March 28 and Tuesday, March 29. Monday, March 28, 10:00-11:00 a.m.
Tuesday, March 29, 9:00-10:00 a.m.
Monday, March 28, 12:30-1:30 p.m.
Modern Languages faculty will answer questions and offer information about courses, majors and minors within the department. Refreshments and giveaways will also be provided. Tuesday, March 29, 9:00-10:30 a.m.
Tuesday, March 29, 10:00-11:30 a.m.
Do you ever work with data? If your answer is “yes,” stop by to see what’s happening in the world of statistics! Tuesday, March 29, 1:00-2:00 p.m.
IS students will demonstrate their work. Tuesday, March 29, 3:00-4:00 p.m.
Wednesday, March 30, 10:30-11:30 a.m.
Wednesday, March 30, 10:00-11:30 a.m. Learn from current students about their projects, how to find research opportunities, participating in the Washington Semester Program (CMU/WSP) and studying abroad. Refreshments will be provided. Wednesday, March 30, 11:00 a.m.-12:00 p.m. Participate in SDS-themed guessing games for prizes. Refreshments will be provided. Philosophy at CMU: Who are we, and why are we here? Current undergraduates will talk about their experiences with internships and research projects. There will also be information about recent faculty book releases, giveaways, refreshments and a Twitter contest. Wednesday, March 30, 12:30-1:00 p.m.
Assistant Professor of Psychology Kasey Creswell will present a talk entitled “Solitary Drinking in Early Adolescence as an Early Warning Sign for Alcohol Problems in Young Adulthood.” There will also be refreshments and a raffle. Thursday, April 7, 4:30-5:30 p.m.
From courses on Shakespeare to multimedia, coding to poetry, the Department of English offers something for everyone. Bring your questions and we’ll bring the popcorn! Thursday, April 7, 4:30 p.m. Ask Professor Tarr anything: about the department, CMU, Pittsburgh, bikes, woodworking, guitars... or try to stump him with things he actually doesn’t know about! He can also answer questions about careers and other opportunities in psychology and neuroscience. Moved to: Monday, April 11, 3:00-5:00 p.m. Learn about Fall 2016 course offerings and enjoy Dave & Andy’s ice cream. Thursday, April 14, 4:00-5:00 p.m.
Storytelling is a key aspect of the human experience. English department faculty and students will participate in a panel discussion on the art of storytelling, which will also feature Three Rivers Storytelling Festival Producer Kate McConnell and StorySwap Inc. President Mike Kennelly. Refreshments will be provided.